If you're on the search for the very best Xbox One prices you've come to the right place. We've been researching all the latest online retailer Xbox One sales every week to bring you the best value bundles from a variety of retailers. 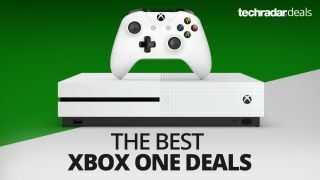 We generally find opting for an Xbox One bundle instead of a console-only deal is a smart way to go as you'll most likely get more for your money, with extra games and/or accessories thrown in to sweeten the deal. To make finding the best Xbox One bundle deal less tasking, we've scoured the internet for the lowest prices on bundles and best console deals and rounded them up here in one spot for you. Below you will find the lowest prices for both the Xbox One S, Xbox One X and the newly released Xbox One S All-Digital Edition. Can't decide which console is best for you? We'll run through the differences between the consoles before showing the deals for them, so you're prepared to make the best buying decision. Looking to buy an Xbox One in the UK or Australia? Then you'll want to take a look at our UK page or AU page. Microsoft has announced the release of the long-awaited Xbox One S All-Digital Edition and is available for pre-order now. The all-digital console will be priced at $249 and will be available for purchase on May 7. This version of the Xbox One lacks a Blu-ray drive so all games must be downloaded for the disc-less console. The Xbox One S All-Digital Edition allows you to enjoy disc-free gaming so you can download the games you want and instantly play them. You'll be able to build a library of digital games that will travel with you and pick up where you last left off. The newly released Microsoft bundle includes the 1TB Xbox One S All-Digital Edition console, a wireless controller, and download codes for Minecraft, Forza Horizon 3, and Sea of Thieves. While the All-Digital Edition is priced $50 less than the recommended price of the Xbox One S, you can usually find bundle deals on the One S console for the same price or less. That means there should be opportunities for bundle deals on the All-Digital Edition, which will be updated on this page along with the best prices from online retailers. The slimmed-down design of the Xbox One S looks much better than the original chunky box and the power brick has been absorbed making things a bit tidier behind your TV. The main draw, though, is support for specialized 4K Blu-Rays and 4K Netflix content. Most Xbox One S models nowadays come with an improved 1TB of storage, but there are a few 500GB units lingering too. The limited edition 2TB models have all but disappeared now, but they sometimes pop up with inflated price-tags. Let's take a look at the cheapest Xbox One sale prices below, followed by the bundles. Released in November 2017 at a list price of $499, the HDR and 4K-equipped Xbox One X is considerably more expensive than the Xbox One S. The prices below are mainly for the console on its own. But if you'd like to see the options that include games too (sometimes you'll get ones thrown in for free), then head on over to our dedicated Xbox One X bundles page. Need to top off your Xbox Live Gold membership? Don't pay the default automatic $60 renewal price. Check out our range of Xbox Live Gold deals to save some serious money. Still considering a PS4 instead? Then you'll want to take a look at our cheapest PS4 bundle deals. You can also shop the best cheap US TV deals and sale prices that are currently available.